LAGOS FEBRUARY 9TH (NEWSRANGERS)-Troops of the Nigerian Army participating in Exercise Python Dance III have killed a suspected kidnapper and rescued four civilians in Ukpelede community in the Ahoada West Local Government Area of Rivers State. Our correspondent learnt that the troops, attached to 29 Battalion and 6 Division Area on Thursday, encountered a gang of armed kidnappers during a sting operation along the East-West Road, while they were escaping with their victims. The troops thereafter shot dead one of the kidnappers, whose identity had yet to be obtained, while others escaped from the scene, abandoning their hostages. According to a release by the Deputy Director, Army Public Relations, Col Aminu Iliyasu, on Friday, items recovered from the kidnappers were: one motorcycle, 12 live cartridges, one axe, one cutlass, two masks and a mobile phone. 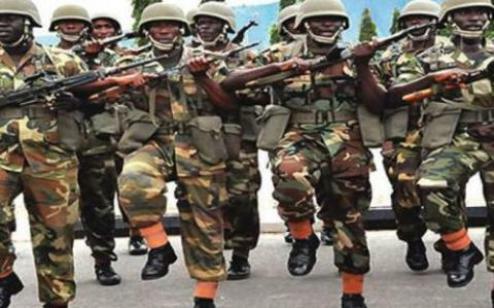 Iliyasu said, “In continuation of Exercise Egwu Eke III in the 6 Division Area of Responsibility, troops of 29 Battalion in Port Harcourt clamped down on suspected armed robbers and kidnappers in Ukpelede community. The suspected kidnappers, on sighting the troops, fired frantically and fled but they were pursued by the troops. “Consequently, one of the kidnappers was gunned down while others fled into the nearby bush. The body of the gunned down suspect and four rescued civilians have been handed over to the appropriate authorities. .
“Also, our troops were able to discover and destroy six illegal oil refineries in Bille community in the Degema LGA of Rivers State.